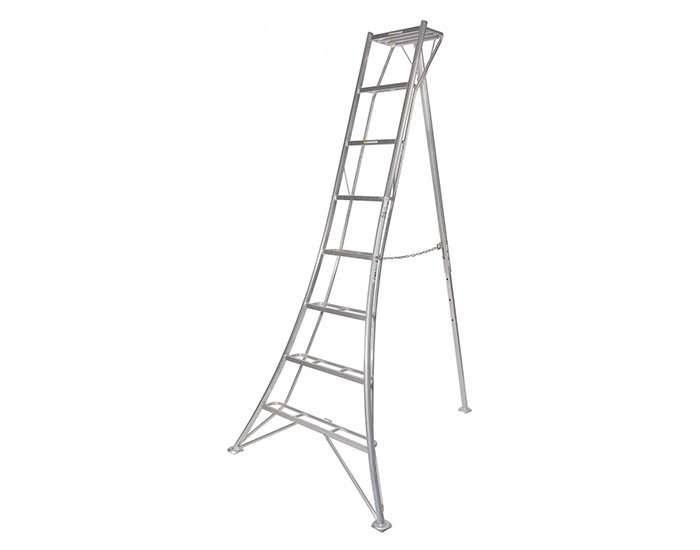 The Niwaki Tripod Ladder is essential for large topiary and hedges. Depending on the slope, you can either work face-on, with the 3rd leg poked into the hedge, or sideways, with the ladder parallel to the hedge.Their adaptability (3 legs), stability (wide base) and comfort (double rungs) allow you to spend all the time necessary to do jobs properly, without rushing. Ideal for orchard work, both for picking and pruning, where thanks to the single back leg, you can get right into the crown of the tree. Unlike traditional orchard designs (pointed A-Frame), you can lean over the top, or rest picking baskets etc on top. They’re also considerably wider at the base than A-Frames, have the telescopic back leg (vital on slopes) and of course, are welded not riveted, so are much, much stronger - and exceptionally light and easy to use.